Used Mercedes S-Class Review - 1999-2006 | What Car? 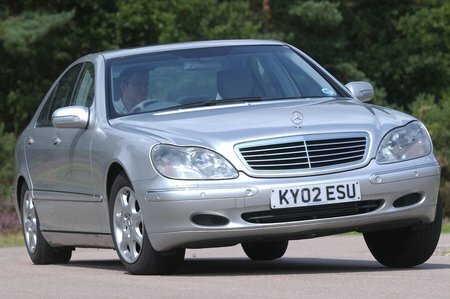 What's the used Mercedes S-Class saloon like? When it was launched, critics hailed the Mercedes S-Class as among the very best executive saloons you could buy, regardless of price. It's a big car with a huge cabin, but it's also sleeker and less daunting than the slab-sided previous model. Inside, it's supremely comfortable and all models have generous equipment levels, which most first owners added to from a long list of options. The big Merc drives neatly for its size and responds well, feeling much smaller than it really is. The standard seven-speed automatic gearbox is superb and wind noise is shut out effectively thanks to the double-glazed side windows. As if all that wasn't enough, the version of the S-Class that replaced this one looks only subtly different, meaning even the earliest examples of this model still look up to the minute. Last, but not least, its value dropped sharply from new, making older ones surprisingly cheap to buy.